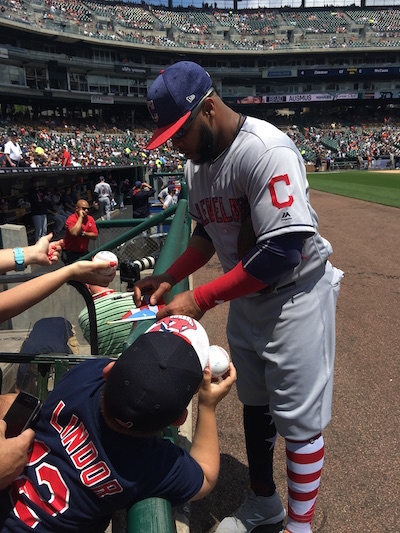 Here is an original photo of Indians first baseman Carlos Santana signing autographs, prior to a recent road game against the Tigers. The shot was gathered by Lance Martinez of My Detroit Sports. Santana, who is now in his eighth MLB season, originally came up as a catcher, but moved to first base, outfield and designated hitter, due to the emergence of Yan Gomes. Santana has put together a good career, with his best season coming in 2016, when he posted 34 homeruns and 87 RBI. Thus far in 2017, Santana has 23 long balls and 75 RBI for the red-hot, first place Indians, who are currently on a 14-game winning streak. Santana and the Indians come into Thursday with an 83-56 record, which allows Cleveland a great opportunity to get back to the World Series. The franchise remains in search of its first World Series victory since 1948.